Nothing is more essential to the operating budget of an independent school than the Annual Fund campaign. It is common practice for schools like us to rely upon the Annual Fund to provide an education above and beyond the cost of tuition. Your generous support makes it possible to attract accomplished teachers, offer an innovative curriculum, and enhance our exceptional programs in science, foreign language, visual and performing arts, wellness, outdoor education, and music. By design, the Annual Fund allows PCDS to keep tuition within reach for a broad spectrum of families, while providing a tax-deductible opportunity to those who participate. This vibrant, six-week campaign takes place each fall and helps provide the resources necessary for a rich and robust academic program. Our goal this year will be to raise $175,000. Support of the Annual Fund ensures that a great educational experience becomes an extraordinary one. Each gift – both large and small – makes a difference in the lives of our students and teachers. We invite you to make PCDS a top priority in your philanthropic giving plans and we sincerely appreciate your support! 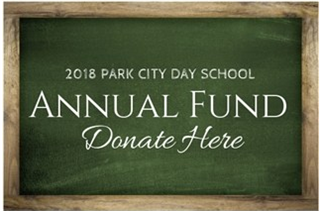 Park City Day School relies upon your tax-deductible Annual Fund contribution to help provide an educational experience above and beyond what tuition covers. Your financial support helps make the difference between a strong academic program and a superior one. Your participation helps to ensure that PCDS has the resources it needs to provide an outstanding curriculum – including specialty programs in Spanish, Science, Visual and Performing Arts, Music, Foreign Language and Wellness – to promote self-confident, inquisitive, compassionate, enthusiastic and self-starting learners. New Instrumental Music Program -- launched partnership with “Arts Youth Empowerment” and hired a part-time music instructor; implemented music classes throughout the Lower and Middle School, including strings, songwriting, and ensemble. Expanding Outdoor Education Opportunities -- created part-time OE director position; new equipment purchased, including a second trailer and new tents; enhanced range of program offerings. Early Childhood Enhancements -- new full-time staff added; new programmatic opportunities in Wellness and Music; new furniture. Assuring a Program of Academic Excellence -- launched International Baccalaureate program with successful achievement of Primary Years Program candidacy; added supplementary math program; adopted teacher evaluation framework; applied for membership in “Round Square,” character education and experiential learning organization; hosted foreign students and sent four students and two staff to a Round Square conference in Colombia. Professional Development Opportunities for Faculty and Staff -- providing ongoing training for faculty and staff in areas such as International Baccalaureate, Teacher Evaluation Framework, Outdoor Education Risk Management and Enrollment Management. Broad participation by the PCDS Community is as important as the gift itself. Every dollar and every family counts. Your gift makes a difference in the lives of PCDS students and teachers! The Annual Fund provides an education above and beyond the cost of tuition. By design, the Annual Fund allows PCDS to keep tuition within reach for a broad spectrum of families, while providing a tax-deductible opportunity to those who participate. Your generous support makes it possible to attract accomplished teachers, offer an innovative curriculum, and enhance our programs in science, foreign language, visual and performing arts, wellness, outdoor education, and music. We sincerely appreciate your support. Each gift – both large and small – makes a difference in the lives of our students and teachers! This year, the Annual Fund Campaign runs from October 1 to November 9, 2018. Corporate matching gift programs are the means by which many companies support the charitable giving of their employees and fulfill their own philanthropic goals. Generally the process is very simple and often can be completed online through your company. Check the Corporate Matching List here to see if your company can "double your donation" to PCDS. If your employer is not listed, ask your HR department if your company has a matching gift program or is willing to create one; new programs are created each year. Corporate matching is an easy way to allow your gift to Park City Day School to have an even greater impact.